Nissan just unveiled the Nismo Concept Watch, which will be on display at the Frankfurt Motor Show (10th - 22nd September 2013). 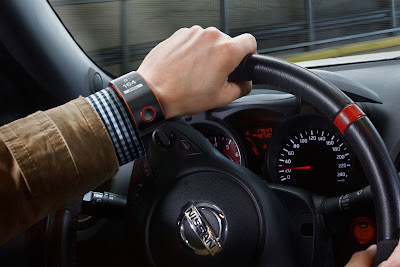 It will be the first smartwatch to connect a driver to the car and will provide drivers with real-time biometric data. The watch will be available in three colours - black, white and the flagship black and red. It will use a lithium battery and will be charged by micro-USB, with a battery life of over seven days under normal usage conditions.